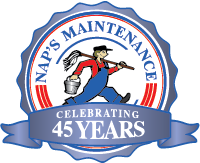 Located minutes from downtown Attleboro, Nap’s Maintenance Service, Inc., has been serving the community for more than 45 years. Named for the original owner, Napoleon Desrochier, Nap’s Maintenance has established a reputation for solid service in the Attleboro area. Today, owner Timothy Henry and his dedicated staff carries on the tradition of excellent maintenance service, expanding Nap’s service area to southeastern Massachusetts, Rhode Island, and beyond. Nap’s offers a wide range of commercial, industrial and residential maintenance services, establishing a solid person-to-person relationship with each of our customers. Contact us for your maintenance needs today!